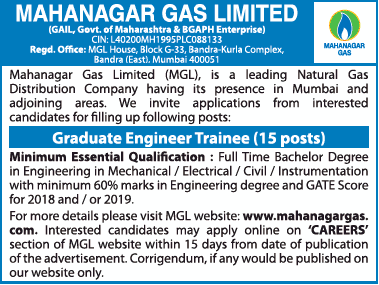 Mahanagar GAS Maharashtra (MGL Mumbai), Mumbai published a new job notification for Graduate Engineer Trainee Posts. The recruitment is for total 15 Vacancies. The willing candidates are informed to see the latest notification March 2019. Last Date of Online application is 11-04-2019. For More details of Mahanagar GAS Maharashtra Recruitment 2019 Read Below. Education Qualification: Bachelor Degree in Engineering and More. For Post wise Education Details follow the detailed advertisement. Interested & Eligible candidates can apply Online through the website www.mahanagargas.com earlier than the due date. Application starts Online 27-03-2019. Last Date of application is 11-04-2019.